EVAPOTRANSPIRATION IN WATER CYCLE ~ Environment Go! WHAT IS THE MEANING OF EVAPOTRANSPIRATION? 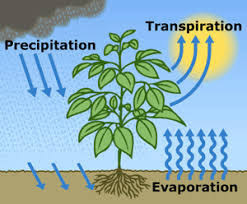 Evapotranspiration in water cycle is a word that houses two similar processes; evaporation and transpiration. 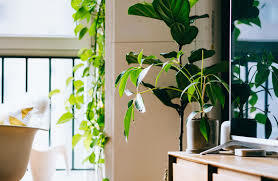 Transpiration takes place on plants and causes the release of water vapor from plants while Evaporation takes place on water surfaces, soil, snow and some other wet materials. Evapotranspiration in water cycle, describes the total water removed from an area by transpiration and evaporation. It is the sum of plant transpiration and evaporation from the earth's land and ocean surfaces to the atmosphere. You can see the position of evaporation and transpiration in the hydrologic cycle. Talking about evapotranspiration calculation is talking about how to calculate evapotranspiration in an area. It is often estimated by subtracting the total outflow for an area from the total input of water. The change in storage must be included in the calculations, unless this change is negligible. The potential Evapotranspiration rate from a well-watered root zone can approximate the rate of evaporation that can occur over a large free-water surface. The available moisture in the root zone will limit the actual Evapotranspiration rate such that, as the root zone dries out, the Evapotranspiration rate decreases. The rate of Evapotranspiration is also a function of soil type, plant type, wind speed and temperature. That is to say that it is affected by soil type, plant type, wind speed and temperature. Strong winds cause an increase in Evapotranspiration rates. Plant types may also dramatically affect Evapotranspiration rates. E.g an oak tree may transpire as much as 160L/day, whereas a corn plant my transpire only about 1.9L/day. Evapotranspiration varies because of a multitude of factors some of which are listed above. It is an important process in the water cycle because it is responsible for about 15℅ of the atmosphere's water vapor. Without that input of water vapor, clouds may never form and precipitation may never occur. Evapotranspiration may also directly affect soil moisture conditions. Thumbs up Uzoma, great article here.